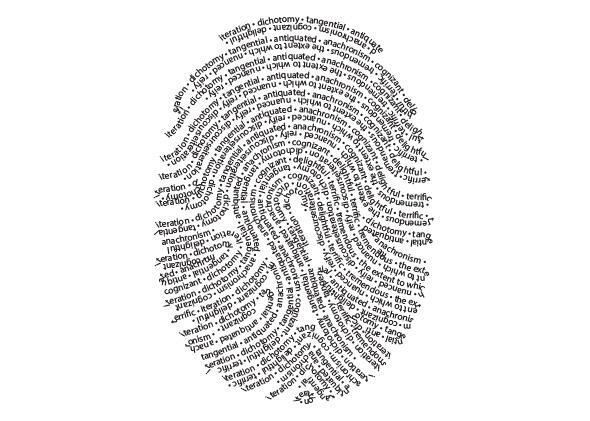 Fingerprint words: Verbal tics that define us, and how they spread to others. The verbal tics that make up who we are—and how they spread to others. Not too long ago, I was forced to come to grips with something terrible about myself. I use the word iteration a lot. More than any human being should. If I had to ballpark it, I’d set the over/under on daily utterances at five. After a fit of denial, and some back-and-forth, I went home after work and asked my wife if there were any weird, fingerprint-type words I used often. She kept going. Turns out I have an affinity for anachronism and maintain a close connection with cognizant. By the time I returned to work the next day, I had begrudgingly accepted that I overuse a bunch of goofy words, and that everyone around me knew it. But I also noticed a change in how I spoke to my colleagues at the office. I was just as apt as ever to pepper a sentence with antiquated, or to throw in an extent to which here and there, but I actively and consciously stopped using iteration. That was my word, even though I hadn’t realized it until the day before. Now everyone was saying it. I didn’t want to appear a mere imitator when I used this noun that now seemed to belong to me. Since the iteration incident, I’ve noticed myself doing this with different words in other contexts. And that got me thinking about the extent to which we all grow attached to or spread or sometimes begrudgingly jettison specific, just-barely-uncommon fingerprint words. When I recently asked several people whether they maintained any such words of their own, or if they were aware of fingerprint words used by loved ones, colleagues, and other acquaintances, the responses poured in. Nuanced. Terrific. Dichotomy. And whatnot. Friends in academia complained about colleagues overusing discourse and reify. And nearly everyone had an anecdote about some pet word being passed from one person to another in various social settings—or, in the case of one Slate editor, her fingerprint word, delightful, ascending among Silicon Valley folks and sadly rendering her a walking cliché. So it seems as though we all have our own fingerprint words, and we’re all simultaneously donating to and stealing from those around us. But how do we pick up these linguistic signature words, and what is going on when we notice other people using those words and we feel, well, a certain way about it? Even more behaviorally suspect, of course, is the take-my-ball-and-go-home response I had to the workplace iteration appropriation I experienced. It seems rather unreasonable to become upset, or to change my manner of speaking, simply because a few people might have plucked one of these semi-uncommon words from my lexicon and begun using it with some frequency. Of all things to fuss and fret over, that perceived injustice is an especially odd one. But my silly reaction is not all that unusual, it turns out. And when they do, we can respond in strange ways. For one thing, we don’t want to be viewed as followers, and we may go far out of our way to avoid that perception. Research by Duke University professor Dan Ariely and Stanford’s Jonathan Levav indicates that people in a group at a restaurant will sometimes go so far as to order a menu item that they will almost certainly enjoy less rather than choose a dish already selected by several members of their dining party. (I love crab legs, and would order them 100 times out of 100 when dining alone. But if everyone before me in a group of 10 colleagues about to chow down at a seafood restaurant orders the crab, I might get the salmon.) Ariely and Levav say that there exists “the desire to portray oneself as interesting and unique” when we interact with others, and that we will in some cases make irrational decisions to avoid looking like a copycat. When we feel as though others have borrowed their hip, new pet words from us, this desire not to be seen as a follower can kick in. And those who think of themselves as language innovators, Boxer says, will be quick to abandon a usage if it grows too common—likely griping and huffing about the fingerprint-word theft in the process. Not surprisingly, there’s a lot going on when we complain about people parroting our linguistic idiosyncrasies. By raising such objections in the presence of others, we not only make sure everyone is aware of our leadership and our tendency to innovate, we also establish that we were doing this newly popular thing prior to all those who jumped on the bandwagon. In other words, our grousing about fingerprint-word usurpation may amount to another display of sorts—a language humblebrag brimming with faux outrage. But when our fingerprint words go mainstream, our response seems to depend largely on who’s doing the taking. For many of us, seeing one of our pet words hit it big with a gaggle of Bay Area tech bros or find its way into the verbal landscape of the jerk down the hall who makes inappropriate jokes at staff meetings would be annoying. But swap in a different bandwagon jumper and everything changes. Alas, it’s unlikely that I’ll be meeting the president in the near future to chat about various versions of proposed legislation or possible revisions to policy presentations or other iterative endeavors. So I won’t be passing on any pet words to the leader of the free world anytime soon. But I also won’t become one of those people who go around stealing the fingerprint words of others. How lazy! How unoriginal! How lame! How long after writing those last few sentences was it before I could think of a time I engaged in the exact sort of behavior that so infuriated me when it happened at the office? About four seconds. I did it a few months ago. One of my closest friends uses the word tremendous often in emails. I’ll send him a link to some especially outstanding baseball catch or a stupid screaming goat video, and he’ll reply, succinctly, “That is tremendous.” Or he’ll email me an article prefaced with, “This is a tremendous story.” It works for him. It really does. And, without knowing it, I’ve snatched that word from him like nobody’s business.